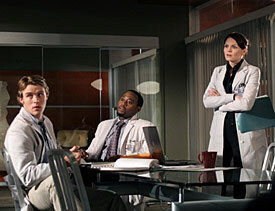 House MD Episode Guide: Season One #110 "Histories"
First Season Episodes :: #110 "Histories"
House's team: Dr. Robert Chase (Jesse Spencer), Dr. Eric Foreman (Omar Epps), and Dr. Allison Cameron (Jennifer Morrison). A homeless woman who draws comic books about James and Mr. Fury. Wilson asks Foreman for help and when Foreman thinks at first that she is faking and afterwards that she is a diabetic who OD'd on her own insulin, Wilson goes to House. When Wilson says, he just wants her to get some medical attention, House says, "That's not even close to being true. Something else. Something personal. Give me the file. Looks like this will be fun." Foreman thinks she is faking (which in part turns out to be true), then they discover that she has ovarian cancer but that doesn't turn out to be her big problem. None really. House sends Foreman to find out what he can about her but her hovel, filled with bats isn't her actual property so there isn't much of an invasion. Rabies. Although, she also had the previously discovered ovarian cancer. After the final diagnosis, Foreman and Wilson find out the she was driving the car that killed her husband and son. House claims he is too sick to work in the clinic so Cuddy insists he teach two students how to take patient histories. He sends them off and when they come back with different histories for the same patient, he investigates and finds a young woman with no memory: Korsakoff's syndrome. See the 11 page Television Without Pity Recap of "Histories"